Are high precision die and chip applications increasing your manufacturing costs while lowering your yields, resulting in decreased profits? 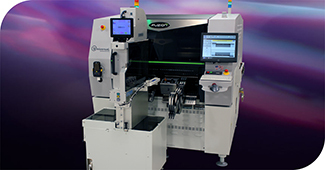 Universal Instruments’ FuzionSC™ Platform offers a complete solution to flip chip package applications by blending the strict accuracy demands of Semiconductor assembly with the speed and robustness of Universal’s Fuzion Platform. With the ability to handle all facets of flip chip assembly, FuzionSC reduces operating and capital costs by maximizing throughput per floor-space. FuzionSC1-11 – Flexible configuration delivering best-in-class throughput and accuracy for semiconductor applications. Offers the widest component range without reconfiguration. FuzionSC2-14 – High-volume configuration delivering best-in-class throughput and accuracy for semiconductor applications. Maintains superior flexibility over dedicated solutions to support technology changes.